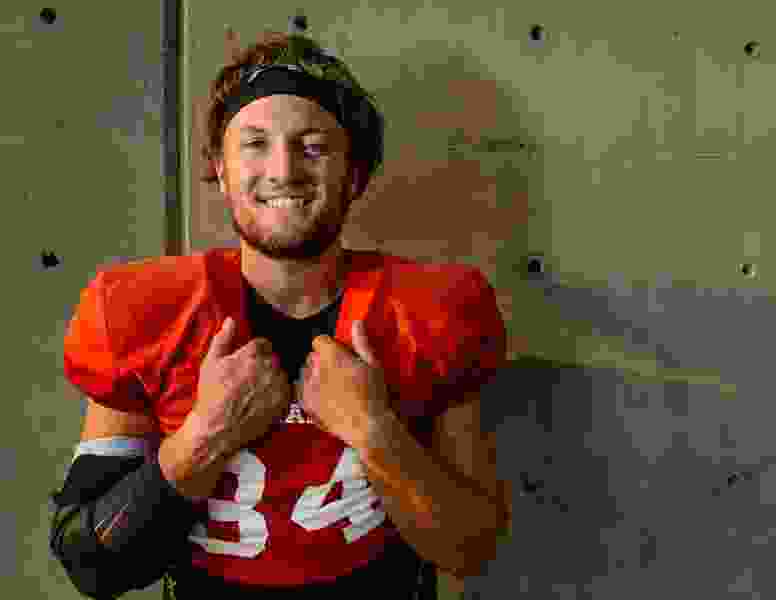 (Steve Griffin | The Salt Lake Tribune) Senior Alex Whittingham, recently won the long-snapping starting job for the University of Utah football team. Whittingham, the son of Utah head coach Kyle Whittingham, has been transparent about his battle with depression and OCD. Hi is photograpjhed here following practice at the Eccles Football Center on the University of Utah campus in Salt Lake City Tuesday September 5, 2017. Alex Whittingham sometimes laughs at the irony of his diploma. The Utes’ long snapper graduated in May with a bachelor’s degree in psychology. “The way the brain works always interested me,” he said. For the longest time, though, Whittingham struggled to understand his own. There were years of pain and anguish as he dealt with the effects of anxiety, depression and obsessive-compulsive disorder (OCD). “Fighting through a storm cloud” is how he described it. And that cloud was on the 24-year-old’s mind this summer when he opened up an application on his iPhone and decided to open up to the world. He never had been one to discuss his personal battle, but he felt better with each sentence he typed. The choice to share his struggles seems to have unburdened Whittingham some. Less than two months after posting that message on Twitter, Whittingham jogged off the Utes’ practice field during rivalry week with a smile on his face, his long, thick hair held back by a black headband. The son of Utah’s football coach said he hopes his words can help someone who needs it. Kyle Whittingham’s son is many things. He is a goofball around his friends and teammates. He is a drummer in a rock band. He is a self-proclaimed Beatles trivia expert. But he is generally not a public person, so his decision to share his story took his father aback. The choice made the father proud. “That was really humbling to me to have people come to me for help,” he said. As rivalry week descended upon the state this week, links between the two programs run deep. And this subject matter might be among the most important, and understated. Alex said he didn’t know the starting quarterback for the the Cougars had come forward to talk about his own mental health issues, hoping to disparage negative stigmas. During Brigham Young University’s Mental Health Week in early April, quarterback Tanner Mangum posted a long message on his Instagram page informing everyone he’s dealt with depression and anxiety for quite some time. Alex’s decision to share his story this summer was prompted by something else: He’d just seen the stunning news that Chester Bennington, the lead singer of Linkin Park, had taken his own life after years of battling depression. When he learned about Mangum’s effort to educate people on mental health, Alex’s smile grew a bit wider. Alex Whittingham went into a spiral while he was serving a Mormon mission in Auckland, New Zealand. He ended up coming home nine months early from his church mission. Weekly emails with his mom, Jamie, kept Alex afloat for the first 15 months. She was one of the first people Alex opened up to, so when the storm clouds hovered over and wouldn’t dissipate, he bent the rules a bit and one weekly email session turned into an impromptu instant-messaging chat. Kyle calls them “hard times” for the Whittingham family. The moments when a parent is helpless and can’t provide the absolute most for his or her child are the ones that don’t ever disappear. The change didn’t come overnight. Alex said he met with several doctors and psychologists after coming back from his mission. Not only did he want to learn to deal with what was now a part of him, but he also wanted to figure out how to ensure he stayed above those looming clouds. Alex approached his dad near the end of Utah’s 2016 season and said he wanted to figure out another way onto the field before he suited up one last season for the Utes. Alex, who initially joined as a linebacker, said he wanted to dedicate himself wholly to special teams — and more specifically long snapping. “I was all for it,” Kyle said. Alex worked on snapping and spinning the ball. So much so that he’s earned the starting long-snapper job. All of his 32 career appearances on the field have been on special teams, one way or another. Alex still receives feedback from his post and never wavers away from the conversation if it’s brought up. Those ongoing moments validate that afternoon he decided to let his guard down and explain what he went through, how he managed his way through it and now is ready to be the listening ear he yearned for so long ago. The tweet remains pinned atop his profile, the first thing Alex wants those potentially in need of help to see.